Since the summer when we remodeled our Family Room (which I’m just realizing now I never did a post on lol) I have been eagerly waiting December so that I could do this. We got a second entertainment system that’s the perfect height to decorate like a fireplace mantle, which is great because we don’t have a fireplace. I always love how my parents decorate theirs and I missed being able to do that once my husband I are got our house. I haven’t done a home tip in quite some time, so in an effort to be better about it this will combine a little bit of crafting with a home tip. Decorating a mantle or the top of an entertainment stand can make such a big impact in any room and there are so many different options that you can really tailor it to your taste. Rather than clutter up the explanation with links to all the things I used, I’ll provide all of that information at the end of the post. I started off with the reindeer head, which I had originally bought months ago to display my headbands at the Shopping Diva Event. I had no intention of using it for Christmas decorations but as it sat on the top of our entertainment stand one night, I though “why not!”. I placed the head in the middle of the top our entertainment stand. I then flanked both sides with silver tinsel wrapped in mini white lights. I used one pack of tinsel for each side and one box of mini lights for each pack of tinsel. 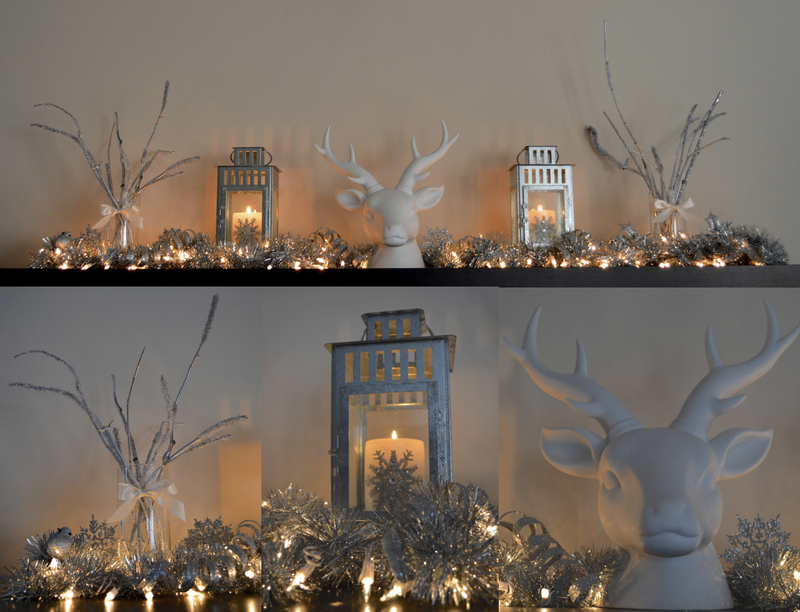 I got the two snowflake candles a few weeks ago and intended to prop them up on my DIY cupcake stands but I really liked the rustic feel the reindeer head had set so I decided to grab two lanterns from our basement and put the candles in there. I propped the lanterns up with a small block of wood so that I could easily swing the doors open over the top of the tinsel garland. I got two circular vases from the dollar store, tied an ivory bow onto them and continued the rustic theme by filling them with my DIY Snow Flocked Branches (tutorial to follow). I then added glitter picks with birds, snowflakes and twirls into the garland to really reflect the lights and add some shine! To make the Snow Flocked Branches: I’ve been collecting branches since the fall… every time it rained I’d grab stray branches from our driveway and store them in the garage. 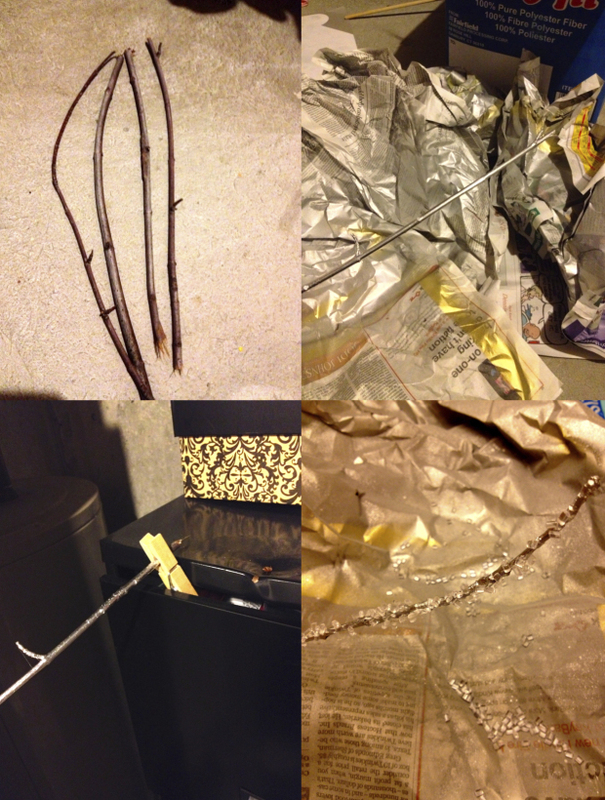 Once I was ready to make these, I snapped them into roughly the same length pieces… you can do short, long, fat, skinny, whatever size branches you like. I then spray painted them silver with Krylon’s Chrome Metallic Paint and propped them in a filing cabinet with a clothespin to dry. Once they were all painted and dry, I applied hot glue all over the ends and sprinkled Diamond Ice Vase filler over that to give it a snow flocked look. Once they were all done, I arranged them loosely in the vases. 1. Ceramic Cast Reindeer Head – from Target, I can’t find it online but saw it still in stores yesterday. 5. Snowflake Candles – from Joann Fabrics, not available online but still in stores in Christmas Inspirations section. 8. Assorted Glitter Picks – from Joann Fabrics, not available online they have aisles full of them in stores! Fun! This is our first Christmas with a mantel to decorate. It’s already decorated but very morning. Thanks for the ideas to spruce it up! I’m so jealous you have an actual mantle to decorate! I’m sure it looks wonderful!